The following cities have or historically had defensive walls. See List of Egypt castles, forts, fortifications and city walls. Louisbourg was a walled settlement located south of the present community of Louisbourg. The settlement was the capital of the French colony of Île-Royale from 1713 to 1758. After the British capture of Louisbourg, its defensive fortifications were destroyed. During the 1960s and 1970s, one-quarter of the historic settlement was rebuilt in a reconstruction project by the Government of Canada, including portions of its defensive walls. Completed in 1744, the walls surrounded most of Old Montreal. The walls were demolished in the beginning of the 19th century, although some of the wall's foundations was left alone, and later buried. The wall's foundations were later unearthed at the Champ de Mars, and at Pointe-à-Callière Museum. Santo Domingo was a fortified city from the 16th to the early 20th centuries. Parts of the wall are still visible in the Colonial Zone. One of the main gates is very well preserved and centuries ago was named "The Gate of the Count" after the Count of Peñalba, who stopped the invasion of William Penn and Robert Venables during the Siege of Santo Domingo. Boston, Massachusetts, maintained a defensive city wall and gate across Boston Neck, the sole point where the city was connected with the mainland, from 1631 until the end of the 18th century. Charleston, South Carolina was a walled city from the 1690s until the 1720s. A portion of the wall, called Half Moon Battery, is still visible in the Provost Dungeon of the Old Exchange Building. New Orleans, Louisiana, planned in 1718 as a walled city. The wall was present during the Battle of New Orleans, but was found to be in such a state of disarray that it could not be used. Beijing, see City Wall of Beijing. Many parts of the walls of Beijing were demolished during the 1960s to open large streets around the city. A metro line also follows the location of the former city walls. Walled villages can still be found in Mainland China and Hong Kong. Xi'an - The city of Xi'an has well-preserved walls with a water filled moat that is a tourist attraction incorporating small parks surrounding a busy and modern area of the city. 12th century Jaisalmer Fortress City from northern approaches at dusk, in Jaisalmer, Rajestan, India. A World Heritage site. An 18th century wall made by Hamengkubuwono the 1st from the Ngayogyakarta Hadiningrat Kingdom to protect the inner capital city from the Dutch and other enemies during the Mataram Kingdom period. Today, 96% of the wall still exists and is a local landmark. On 17 February 1745, the Surakarta Kingdom moved to a new opened forest named Sala Village and build their Royal Residential Palace and urban area with a 15 kilometers long of "Beteng Kraton" or Palace wall around it. The wall was 90% exist. Well known as Banten Kingdom's capital. The wall was destroyed by the Dutch during its colonial period in the way to ended the Banten reign. The city wall that left is only about 10% from the real appearance. Trowulan was the capital of the former Majapahit Empire. When its glory period, the capital being a first European systemized ancient city (with city canal system for transportation and also large aisle and road for major transportation)in Indonesia, because Trowulan was developed in Majapahit's glory period in 13th–15th century. The wall was protecting the inner "Kraton" or royal palace and some important places. Today the wall can't be seen as the original appearance. Acre – 18th-century modern Ottoman fortification able to withstand cannon attack. The wall has been restored and now includes a rampart for tourists. Beirut: sections of the Phoenician and Roman fortifications and Ottoman citadel have been unearthed in the city's central district. The famous walls erected by Emir Fakhruddin II have yet to be recovered. Sidon: little remains today of the city's medieval fortifications, except the Castle of St. Louis. Malacca - Built by the Portuguese after the city's occupation in 1511, it was torn down by the British in 1806. Known locally as the A Famosa. Manila (Intramuros) – partially preserved, partially restored after World War II. Original walls are still well preserved. Wikimedia Commons has media related to City walls in Thailand. Tapae Gate in the eastern wall surrounding the old city of Chiang Mai. Chiang Mai was surrounded by a moat and city walls when it was established by King Mangrai the Great in 1296. They were extensively rebuilt in the early 19th century. Large parts of the city walls and city gates of Chiang Mai survived till the present. Amstetten Not walled but ditched and banked with gate towers. Mautern - remains of the Roman fortress "Favianae" can be found at the western side of the old town. Schwanenstadt the settlement surrounded by a bank, surmounted by wooden palisade, with only a short length of wall adjacent to the ‘‘Stadtturm’’. Zeiselmauer. The Roman auxiliary fort was re-fortified by the Babenbergs in the 10th century, but never granted a market or charter. Baku, retains most of the city walls that separate the historic Inner City from the newer parts of the city developed after the 19th century. Aarschot Flemish Brabant Yes One or more individual structures (Bastions, gates towers, etc.) remain. The most significant remain of the medieval fortifications which surrounded the town of Aarschot is a tower located on top of a hill just south of the old town, named the Aurelianustoren or Orleanstoren. Ath Hainaut Yes One or more individual structures (Bastions, gates, towers, etc.) remain. Ath was fortified several times during its history. Of the oldest fortifications, the old castle, including the Burbant Tower, still stands. The bendy course of some of the streets surrounding the old town are vestiges of the bastioned ramparts of the post-medieval era. Some remnants of these fortifications still remain to the north of the old town, near the Boulevard Alphonse Deneubourg. Arlon Luxembourg Yes One or more individual structures (Bastions, gates, towers, etc.) remain. A smallish citadel stands in the center of the old town, on the location of a destroyed Medieval castle. Beaumont Hainaut Yes One or more individual structures (Bastions, gates, towers, etc.) remain. A sizable stretch of the old city wall remains to the east of the old town. The most notable part is the old Tour Salamandre, an old keep tower. Binche Hainaut Yes Sizable parts of the fortifications remain intact. The city of Binche sports the most intact set of city walls of Belgium. Built in 1230 AD, they are 2.1 kilometers long and sport about 30 towers. There were six gates, but these have been demolished in the 19th century. Bouillon Luxembourg Yes One or more individual structures (Bastions, gates, towers, etc.) remain. Apart from the impressive medieval castle, three small, tower-like bastions, as well as several small stretches of curtain wall, remain of the wall built around the town by the French military engineer Vauban in the 17th century. Bruges Western Flanders Yes One or more individual structures (Bastions, gates, towers, etc.) remain. Out of the nine gates in the 14th-century walls, four survive today. Several stretches of the earth fortification wall surrounding the city are still in place. Apart from a single tower, no trace remains of the stone wall that topped some parts of the earth ramparts. A single tower of the first city wall can be seen across the canal at the Pottenmakersstraat. Brussels Brussels-Capital Region One or more individual structures (Bastions, gates, towers, etc.) remain. Of the first city wall, built in the 13th century, a small stretch of curtain wall and several isolated towers still remain. Of the second wall, only the Halle gate remains. The inner ring road of Brussels now occupies the location of this second wall. Chièvres Hainaut Yes One or more individual structures (Bastions, gates, towers, etc.) remain. A large stretch of the medieval town walls still remains behind the church of Our Lady (Notre Dame) and the houses alongside the Rue Hoche. A wall tower, the Tour de Gavre, also remains next to the church. Dalhem Wallonia One or more individual structures (Bastions, gates, towers, etc.) remain. Several remains of the town and caslte's fortifications can be found at the back of the houses alongside Rue du Général Thys. The ruins of the castle are also located on Rue du Général Thys. Damme West Flanders Yes One or more individual structures (Bastions, gates, towers, etc.) remain. The location of the 16th-century, seven-sided ring of fortifications can still be seen as low hills in the fields and gardens surrounding the old town. A small portion of the inner and outer wall was reconstructed in 2001. Dendermonde East Flanders Yes One or more individual structures (Bastions, gates, towers, etc.) remain. Dendermonde received a new set of city walls in the 19th century, being an important part of the Wellington Barrier. Currently, various structures, including the arsenal, barracks, two gates, and several parts of the walls (transformed into a park) remain. Diest Flemish Brabant Yes Sizable parts of the fortifications remain intact. To the north of the city centre, one can still find two polygonous fronts featuring a land gate; a water gate and a ravelin. An outer wall in front of this wall fragment sports two dilapidated casemated caponieres. To the east, the shape of several bastions have remained intact. An outer work, to the east of the fortifications, is incorporated in a swimming pool complex. The Citadel remains mostly intact, although the side facing the city was demolished to make room for barracks. There is a small fortress to the north of the city center. Herentals Antwerpen One or more individual structures (Bastions, gates, towers, etc.) remain. Two, much altered, gates of the Medieval fortifications of the town of Herentals can still be found at either end of the town center. Huy Liège Sizable parts of the fortifications remain intact. Sizable portions of the medieval city wall can be found to the south and east of the old town. During the early 19th century, a large fortress was built by the Dutch on the location where a castle had stood several centuries before. Kortrijk Western Flanders One or more individual structures (Bastions, gates, towers, etc.) remain. The extensive fortifications of Courtrai have been demolished during the mid-18th century. The only remains are the Medieval Broel towers, standing on either side of the river Lys. A foundation of a defensive wall and a multi angular artillery tower, both situated adjacent to the church of Our Lady, form the last remnants of the first castle of Courtrai. Leuven Flemish Brabant One or more individual structures (Bastions, gates, towers, etc.) remain. Several dilapidated towers and fragments of the Romanesque 12th-century first wall of Leuven can be found throughout the city centre, although a sizeable portion collapsed due to negligence in February, 2011. Of the second wall, only the ground floor of a watchtower and the base of a watergate over the Dijle river still stand. The second wall was changed into a park in the 19th century, this park was largely destroyed and replaced by a ring road in the 20th century. Liège Liège One or more individual structures (Bastions, gates, towers, etc.) remain. Limbourg Liège Sizable parts of the fortifications remain intact. Although partially demolished, sizable remnants of the city wall can still be seen, surrounding the upper town of Limbourg. The best preserved stretches are located on the eastern side of the old town. Lo-Reninge West Flanders One or more individual structures (Bastions, gates, towers, etc.) remain. Only the Westpoort, built around 1250 CE, and consisting of two small towers connected by an arch, remains. Middelburg West Flanders Vestiges of the fortifications are visible in the landscape. Nothing remains above ground of the earth bastions that surrounded this tiny village (which should not be confused with its nearby, much larger Dutch namesake), but the location and course of the defences can still be recognized from air. Mechelen Antwerpen One or more individual structures (Bastions, gates, towers, etc.) remain. Only the Brusselsepoort (Brussels Gate) remains of the old fortifications of Mechelen. Menen West Flanders Yes One or more individual structures (Bastions, gates, towers, etc.) remain. Several fragments of the bastioned trace, first built by the French in the 17th century, but extensively rebuilt by the Dutch, remain. Two bastions are still remaining near the Sluizenkaai and Zwemkomstraat, though heavily built by houses. The casemates of one of the bastions remain intact and can be visited. Mons Hainaut One or more individual structures (Bastions, gates, towers, etc.) remain. Several fragments of the first city wall of mons have been preserved. Of the later defences, only two bastion-like structures remain to the south of the city centre, but the location of the fortifications can still be seen in the zig-zagging street pattern on the east side of the city. Namur Namur Yes One or more individual structures (Bastions, gates, towers, etc.) remain. Of the defences of the city itself, the enormous arsenal building is the most notable remnant. Some remnants of the bastioned defences may be found in the Parc Louise Marie, as well as at the foot of the citadel. Only small fragments remain of the medieval city wall, most notably a strong round tower, now incorporated into the town hall as the city's belfry. The mighty citadel that grew out of the medieval count's castle, remains mostly intact and can be visited. Ninove East Flanders One or more individual structures (Bastions, gates, towers, etc.) remain. Only the Koepoort (Cow Gate) remains of the old walls of the town of Ninove. Oostende West Flanders One or more individual structures (Bastions, gates, towers, etc.) remain. A portion of the bastioned city wall remains to the south of the town center, transformed into a park. East of the harbor stands an old advanced fortification, known as the Halve Maan (Crescent Moon). A short distance further to the east stands the 19th-century Fort Napoleon, now a museum. Philippeville Namur Yes Vestiges of the fortifications are visible in the landscape. Although the walls themselves were demolished in 1860, an extensive system of 17th-century underground passages remain. A portion of these fortifications is open to the public. Thuin Hainaut One or more individual structures (Bastions, gates, towers, etc.) remain. Several towers and fragments of wall remain around the old fortress town of Thuin, most notably to the south of the old town, above the Hanging Gardens. Tongeren Limburg Yes One or more individual structures (Bastions, gates, towers, etc.) remain. Important parts of the 13th-century wall, including several towers and a gate, remain. Outside the medieval town, one can still find remnants of the first Roman wall, which enclosed a much larger area than the medieval wall. Of the much smaller second Roman wall, no above-ground remnants remain. Tournai Hainaut One or more individual structures (Bastions, gates, towers, etc.) remain. Remnants of fortifications can be found scattered throughout the old town. Of the first fortifications, several towers and a gate remain. Of the second medieval wall, a sizable portion remains to the south-east of the old city, while the Pont des Trous, although severely altered, remains an impressive example of a medieval water gate. A large round tower is all that remains from the fortress built by English king Henry VIII. Of the citadel, only the interior buildings remain, as well as several underground passages which ran underneath the bastions of the fortress. Veurne West Flanders Vestiges of the fortifications are visible in the landscape. The bendy route of the canal as well as the street plan around the city centre clearly indicate the location of the earthen bastions that used to surround the city. Ypres West Flanders Yes Sizable parts of the fortifications remain intact. A wall with 3 unusually flat bastions defends the east side of the city. To the south a medieval gate and the lower portions of two medieval towers can be found. Both towers are defended by a ravelin. A park to the east of the city houses a number of underground passages belonging to outworks built by the Dutch. Zandvliet Antwerp Vestiges of the fortifications are visible in the landscape. The "Conterscherp" road follows the route of the former 17th-century defences around the city, giving the town centre a star shaped appearance from the air. Zichem Flemish Brabant One or more individual structures (Bastions, gates, towers, etc.) remain. The Maagdentoren (Maiden Tower) is what remains of the medieval town walls. A ring road indicates the trace of the now demolished fortifications. Zoutleeuw Flemish Brabant One or more individual structures (Bastions, gates, towers, etc.) remain. Remnants of the first 12th-century city wall and a gate can be found incorporated in the old city hall and the adjacent house. Outside the city, a bridge over the river Gete incorporates a partial reconstruction of a 14th-century watergate belonging to the second wall. To the south of the city, several low hills in the landscape indicate the position of a Spanish-built citadel. To the east of the old town stands the “Heksenkot”, a tower of the old city wall. Hisarya - the old Roman town is still surrounded by the ruins of its defensive walls. 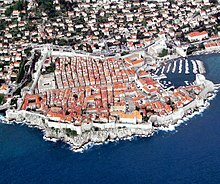 Dubrovnik has well-preserved city fortifications including towers, gate, rampart walk and two citadels guarding the docks. Walls of Dubrovnik are among the finest and most complete in Europe. Krk city walls which obtained their current appearance between the 12th and the 15th centuries but the town itself was fortified since Roman period. Karlovac city walls, built in 1579 as a six-point star with bastions. Split – several remains of the defensive walls of Diocletian's Palace still survive to this day, including 3 gates and long stretches of the fortified Roman walls. Most of the towers are now demolished, apart from 3 square towers, each of them located at a corner of the palace. North of the town centre are the remains of a bastion trace, which includes portions of the walls and a bastion located in a park. Ston: Walls of Ston were built in 14th and 15th centuries, at the isthmus of the Pelješac peninsula, to the north of Dubrovnik; 890 meters long town wall and 5 km Great Wall outside the town Ston. The first major fortification in Famagusta was the Othello Tower, which was built by the Lusignans in the 14th century and was later modified by the Venetians. The latter also built city walls in the 15th and 16th centuries, and they remain intact today. The first fortifications in Nicosia were built in the 13th and 14th century. The Venetians demolished the medieval fortifications and replaced them with a circular bastioned enceinte in the late 1560s. The walls remain largely intact except for some breaches. Jihlava - Large parts of the town walls remain to the south, west and east side of the medieval town. Some fragments remain on the north side. The fortifications are also a good example of a Zwinger. Fredericia, extensive renaissance ramparts to the north and west of the city and sea facing ramparts. Copenhagen, extensive renaissance ramparts to the south and east, trace remains to the north and west, nice fort at the harbor mouth, three small island fortlets outside the harbor entrance. Nyborg – the remains include three preserved bastions, a town gate and the old town is still mostly surrounded by a moat indicating the locations of the other (now demolished) bastions. Stege, One of the town gates, the Mølleporten, still remains. Most of the earthwork rampart and dry ditch surrounding the town center still remain. Part of Tallinn City Walls. Pärnu, a rampart with two bastions, a moat and a town gate remain to the west of the old town. It is now transformed into a park, the Valli Park. Coucy-le-Château-Auffrique - Large parts of the walls remain, though partly in a ruinous state. Remains include several towers, stretches of curtain wall and three gates, the Porte de Laon, Porte de Soissons and the Porte de Chauny. Loches - large parts remain intact. The upper town and the Loches castle are built on a hill which offers a strategic position over the surrounding countryside and the Indre river. The walls of the upper town remain largely intact and include the ruins of the Porte de Saint-Ours, the well preserved Porte Royale, long stretches of curtain wall and several towers and bastions. The walls of the lower town are partly demolished, but 4 towers, a few smaller later-added turrets, a long section of curtain wall and the well preserved Porte des Cordeliers and Porte Picois (which now serves as the City hall) still remain intact. Saint-Junien - A tower and remains of the curtain wall remain behind houses at the junction of the Boulevard de la République and the Rue de Brèche. Saint-Valery-sur-Somme - Large parts remain, including the Porte de Nevers, the Porte Jeanne d'Arc, stretches of curtain wall and some towers. A hill named Cap Hornu arises above the town which is the most likely and possible location of the Roman Saxon Shore fort and harbour named Locus Quartensis sive Hornensis. Aachen, some parts of the inner walls still remain alongside Tempelgraben (at the corner with the Eilfschornsteinstraße and the corner with the Pontstraße), and at the back of the houses alongside Seilgraben. Of the outer walls three towers, the Langer Turm, Pfaffenturm and the Marienturm, still stand today. The two remaining city gates, Ponttor and Marschiertor, are among the best preserved gates in Germany. Altentreptow – the remains include some stretches of wall, a tower and two town gates, the Brandenburger Tor and the Demminer Tor. Arberg - only one town gate remains. Aub – large sections of the walls remain, including some towers. One town gate remains, the Zentturm. Bad Langensalza – large parts of the walls still remain today, including 12 wall towers and one city gate, the Klagetor. Berlin had a defensive wall around the city from about 1250 until the mid-17th century, and a Customs Wall from the mid-18th to the mid-19th centuries. The Berlin Wall that existed from 1961 to 1989 was claimed by the authorities of East Germany to be defensive, but in fact it was rather intended to prevent unauthorized emigration. Parts of Berlin's medieval wall still remain alongside the Littenstraße. Bernkastel - one town gate, the Graacher Tor, remains. Bönnigheim – some parts of the walls and a town gate remain. Chemnitz - only one tower remains, the Roter Turm (Red Tower). Crailsheim – some remains are located north of the Ringgasse, including a wall tower. Another tower remains alongside the Grabenstraße. Dausenau – the walls remain almost intact. One town gate still remains, the Torturm. Demmin large parts of the city walls still remain alongside Nordmauer, Bauhofstraße and Südmauer. One town gate still remains, the Luisentor. Dinkelsbühl – the medieval town walls remain fully intact, including 4 gates and 19 towers. Dresden - Dresden’s Defensive walls were some of the first in Germany, inspired by the earlier Italian model. The walls surrounded both the ‘Old City’ south of the Elbe, and the ‘New City’ to the north. The walls, gates and moats were largely removed c.1815, following the Napoleonic Wars, being deemed outmoded for modern warfare. Some small sections have been rediscovered and established as the Museum Festung Dresden http://www.festung-dresden.de/de/festung_dresden/museum/ below the more famous Brühl Terrace. Erlangen – some stretches of wall still remain alongside Nördliche Stadtmauerstraße, Wöhrstraße and Schulstraße. Gardelegen – there are several remains of the old town wall, including the impressive Salzwedeler Tor, the remains of the Stendaler Tor, and some stretches of wall. Gartz (Oder) - The remains of the walls around the medieval town include some sizable stretches of walls, towers and one town gate, the Stettiner Tor. Göllheim – two town gates are preserved, the Kerzenheimer Tor and the Dreisener Tor. One tower remains, the Ulrichsturm. Gräfenberg – the remains include three well-preserved town gates, the Egloffsteiner Tor, the Hiltpoltsteiner Tor and the Gesteiger Tor. Some parts of the walls still remain adjacent to the Gesteiger Tor and at the back of the houses alongside Am Gesteiger and Schulgasse. Grebenstein - most of the medieval walls are still surrounding the old town. One town gate remains, the Burgtor. Grimmen one tower still remains, the Wasserturm. All three of the original town gates also remain, the Stralsunder Tor, Greifswalder Tor and the Mühlentor. Heidelsheim – one town gate and a wall tower still remain today. Hollfeld – the remains include one town gate, the Obere Tor, and some parts of the walls to the south of the old town. Horb am Neckar – large sections of the walls still remain. One town gate, the Ihlinger Tor, still remains, and some towers still remain, most notably the Schurkenturm and the Schütteturm. Ingelheim am Rhein - sizable remains, including stretches of wall, the Malakoffturm, the Bismarckturm, Ohrenbrückertor, Uffhubtor and the ruined Heidesheimer Tor. The medieval town centre also houses the ruins of the Ingelheimer Kaiserpfalz. Alt Kaster - The old medieval town of Kaster now forms part of Bedburg. The town walls remain largely intact, including 2 town gates and several towers. Kemnath - several sections and towers of the walls remain around the medieval town. The eastern town gate was later converted into a church tower. Kempen - some parts of the walls still remain. They include the Kuhtor, a well-preserved town gate, the Mühlenturm and the remains of another town gate, the Peterstor. Lauffen am Neckar - the old town consists of three parts. While the town is divided by the river Neckar, the castle stands on a small island circled by the river. On the left bank there is a sizable stretch of wall is located next to the church. On the right bank, some towers, stretches of wall and the Neues Heilbronner Tor still remain. Leipzig - remains include the Moritzbastei bastion. Maintal – large sections of the walls still remain, notably to the north of the medieval town. Mainz – the remains include the well-preserved square-shaped citadel, the medieval Alexanderturm, and the remains of a bastion alongside the Augustusstraße. Malchin two town gates still remain, the Kalensches Tor and the Steintor. Some parts of the walls to the south and east of the town still remain. Markt Einersheim – two town gates still remain. Meppen – the remains include a star shaped moat around the medieval town. Monheim – two town gates remain, the Oberes Tor and the Unteres Tor. Munich has some of its former city gates still standing, and a section of its late 13th-century defensive wall. Münzenberg – fragments of the walls remain, including two towers. Monheim – some stretches of wall still remain and both town gates, the Oberes Tor and the Unteres Tor, are preserved. Neuburg an der Donau – some parts of the medieval walls still remain, including the Unteres Tor. The trace of the later bastion earthworks, the so-called Untere Schanze, Elias Holl Schanze and Oberer Schanze, is still recognizable in the fields and from the air. Neunkirchen am Brand – three town gates still remain, the Forchheimer Tor, the Erleinhofer Tor and the Erlanger Tor. Neustadt an der Aisch – substantial parts of the walls still remain, including some towers and a well-preserved town gate, te Nürnberger Tor. Neustadt in Holstein - one town gate remains, the Kremper Tor. Niedernhall – most of the town walls remain intact. Oppenheim – some stretches of the town walls remain near the ruins of Landskron castle. One town gate and two towers remain, the Gautor, the Ruprechtsturm and the Uhrturm. Prenzlau there are some good remains of the walls, especially North, East and South of the town. 4 gates still remain, the Steintor, Wasserpforte, Mitteltor and the Blindower Tor. The walls also include 25 towers. Ravensburg – three town gates still remain, the Frauentor, Obertor and the Untertor. Nine of the original ten wall towers still remain, most notably a tower named Mehlsack. Recklinghausen two defensive towers and some portions of wall still remain today, north west of the old city. Reichelsheim – three towers remain. Rees - large parts of the town walls still remain intact, mainly located at the riverside of the town and in the parks at the north-east and west side of the medieval town. Rhens – the town walls remain largely intact. Three town gates still remain, the Rheintor, the Josephstor and the ruins of the Viehtor. Schwalmstadt – the remains of a town gate still survive, the medieval Lüdertor. The earthworks are mostly demolished, leaving a moat of which the course indicates the location of four round bastions. Seehausen - the moat still surrounds most of the medieval town. Fragments of the walls are to be found at the southern side of the old town. One town gate still remains, the Beustertor. Seligenstadt – the remains include the Steinheimer Torturm, the Pulverturm and a tower at the Friedhofsmauer. Soest - 2,5 km of the town walls (1180) are still intact, also a town gate ("Osthofentor", with the world largest collection of crossbow bolts) and a defense tower ("Kattenturm"). Stendal – two town gates still remain. Sulzbach – sizable parts of the walls and towers still remain. One town gate is preserved, the Rosenberger Tor. Tangermünde – most of the town walls still remain, including some towers. Treysa – the remains are located mainly South, East and North of the old town. Trier, portions of the city walls still exist, but the size of the Roman gate, the "Porta Nigra", gives evidence of the importance of the city. Other Roman remains include the baths, the Constantine Basilica, an amphitheater, and a 2nd-century AD Roman bridge. Weilrod – the only town gate still remains. Werben – one town gate still remains to the north east of the medieval town, the Elbtor. A tower with adjacent portion of the town wall remains to the west of the medieval town. Wunsiedel 3 towers, small portions of the walls and a town gate (Koppetentor) still remain. The walled medieval city of Monemvasia in southern Greece. The seaside walls of Naupactus, Greece. Drama, Greece - sizable parts of the town walls remain to the north and east side of the old town. Including 2 towers and stretches of wall. Koroni - preserved fortifications of the castle and upper town. Buda – the Castle Hill is surrounded by preserved medieval and early modern fortifications. Only a short section survived from the walls of the Víziváros neighbourhood. Pest – segments of the 15th-century city walls are preserved inside the courtyards of later houses. Pécs – long sections of the medieval walls are preserved and freed to later intrusions. Saint Laurence Gate, Drogheda is an original barbican dating from the 13th century. The barbican is widely regarded as one of the finest of its kind in Europe. Another town gate survives in Drogheda, the Buttergate. It is thought to have been used as a pedestrian entrance to the town as no road ran to or from it. still retains over a kilometer of medieval town wall – 90% of the circuit. Some sections survive to a height of over 8 meters (26 feet)plus). Towers for city wall in Genoa. Albenga - fragmentary remains, including stretches of wall and 3 town gates. Arezzo - Large parts of the town walls still survive, including several stretches of curtain wall, 6 bastions, 4 town gates and the well preserved citadel Fortezza Medicea. Bagnacavallo - two town gates remain. Brindisi - several parts of the walls are preserved, including 5 bastions and two town gates, the Porta Lecce and the Porta Mesagne. Brunico - three gates remain, the western, northern and eastern ones. Castel Bolognese - three wall towers still remain. Fano – large sections of the Roman walls and towers are preserved. One town gate still remains, the Roman Arco di Augusto. Forlì - remains include the ruins of the Porta Schiavona. The foundations of a tower can be found in the roundabout at the Piazza Santa Chiara. Grosseto's star shaped town walls are almost completely intact. Guastalla - a star shaped road around the town indicates the trace of the fortifications. A wall tower still stands at the corner Via Giuseppe Verdi/Via Volturno. Marostica - The defensive walls around the old town are fully intact. The walls are among the best preserved medieval defensive structures in Italy. Including 3 town gates, 20 towers and two castles, the Castello Superiore and the Castello Inferiore. Mignano Monte Lungo - the Porta Fratte town gate is the only remain of the medieval town walls. Monte San Giusto - fragmentary remains, including an impressive town gate and a tower. Muggia - remains include two towers, two stone bastions, two town gates and large stretches of the walls. Nardò - several fragments of the walls still stand around the town, including many towers which are incorporated in houses. Pesaro - the remains include two bastions, a curtain wall and a town gate, the Porta Rimini. Reggio Emilia - very little remains of the medieval town walls. One town gate remains, the impressive Porta Santa Croce. A stretch of wall is located at the Viale Monte Grappa. Santarcangelo di Romagna – most of the medieval town wall remains around the olt town, including long stretches of wall, a gate and several towers. Sassari fragmentary remains, mainly at the north side of the old town. Spilamberto - one town gate still remains. Susa - fragmentary remains of Roman walls. The cathedral is built against the side of the Roman town gate Porta Savoia. Several parts of the walls and three lowered towers can be found alongside the Corso Unione Sovietica. Torino - the remains include the impressive Roman town gate Porta Palatina and 3 bastions with turrets and curtain walls in the park nearby the Porta Palatina. Vicenza large sections of the town walls still remain, mainly alongside the Viale Giuseppe Mazzini, Via Goivanni Cecciarini and the Via Legione Gallieno. Four town gates remain, the Porta San Bortolo, Porta Santa Lucia, Porta Castello and the Porta Santa Croce. Riga – the best preserved part of the old town walls is the Powder Tower. Just north west of the Powder Tower remains a stretch of wall with a square tower. Foundations of the wall can be seen at Kalēju iela street, and there are fragments of a ruined wall at the site of a demolished building at Minsterejas iela street. The only remains of the earthen ramparts around the old town is a star shaped moat, now transformed into a park. An ancient Castrum Maris stood in Birgu since the 13th century. This was rebuilt as Fort St Angelo in the 16th and 17th centuries, when walls surrounding the entire city were built. Most of the fortifications are intact, except for a small part which was destroyed in a magazine explosion in 1806. The fortifications were built by the Order of Saint John in the 17th and 18th centuries. The city was heavily bombed in the Second World War, but its fortifications remain largely intact although they are in need of restoration. The area was fortified in the 17th century when the Floriana Lines were built. The walls remain largely intact, although in a rather dilapidated state. The town was first fortified by the Phoenicians, and the current fortifications are based on those built by the Arabs in the 9th to 11th centuries. The fortifications were extensively modified in the Middle Ages, and then by the Order of Saint John until the 18th century. The walls were recently restored, and they are some of the best preserved fortifications in Malta. The town was fortified in the 1550s by the Order of Saint John. Most of its fortifications including Fort Saint Michael were dismantled in the 19th and 20th centuries, and the walls sustained damage in World War II. However, some still survive to this day, including the impressive seaward bastions and part of the land front. The fortifications of Valletta were built by the Order of Saint John between 1566 and 1571, and continued to be modified several times in the following centuries. The City Gate was rebuilt five times, the latest one being completed in 2014. The fortifications of Valletta remain intact, except for a lunette that was demolished in the 19th century and some breaches in the walls. The area was first fortified in the Bronze Age, and was one of the earliest settlements on the Maltese islands. It became the administrative centre of Gozo during Punic-Roman rule. The city of Rabat (now also known as Victoria) was fortified during the Middle Ages, with the acropolis of the Roman city being converted into a castle known as the Cittadella. The city walls were demolished in the 17th century, and at this point the Cittadella was rebuilt by the Order of Saint John. No remains of the city walls survive, but the Cittadella survives intact. Defensive walls of Kalaja, Ulcinj. Kotor - built by Illyrian tribes in the 9th century and enlarged many times from the 13th century until the 19th century. 's-Hertogenbosch North Brabant Yes Sizable parts of the fortifications remain intact. Of the first city wall, built in the 13th century, one tower, belonging to one of the city gates, remains incorporated in a house on the Hinthamerstraat. Another remnant of the first city wall is formed by a gate over one of the arms of the Binnendieze River near the Korte Waterstraat. Sizable sections of the second, 13th-century city walls, and 17th- and 18th-century bastions remain intact as they serve as flood prevention measures. Of special note is the 17th-century pentagonal citadel. Aardenburg Zeeland Vestiges of the fortifications are visible in the landscape. In 1625 AD, a new trace of earthen ramparts was built. These defenses were demolished between 1688 and 1701 AD. One city gate, the Westpoort, survives. Additionally, remnants of bastions, ravelins, and other outworks are clearly distinguishable in the fields surrounding the town. The foundations of a Roman gatehouse with 2 towers can be found at the Burchtstraat. The foundations of a Roman tower are now incorporated in the playground of a local school. Amersfoort Utrecht Yes Sizable parts of the fortifications remain intact. Of the first 13th-century city wall, one tower and the barbican of one gate, the Kamperbinnenpoort, remain. After the enlargement of the city in 1450 AD, houses were built on the location of the first wall, and occasionally incorporating fragments of that wall in their structure. Of the 15th-century wall, several stretches remain to the north-east of the old town, while the foundations of the wall have been made visible on the south-eastern side. Two 15th-century gates remain as well; the koppelpoort, a combined land and water gate, and the Monnickendam, a water gate. Amsterdam North Holland One or more individual structures (Bastions, gates, towers, etc.) remain. Of the medieval walls, the Sint Antoniuspoort is the most important remnant. Other remnants of the same wall are the Schreierstoren and the lower part of one of the towers of the former Regulierspoort. Of the later Baroque defenses, only the Muiderpoort remains intact, while some of the bastions can still be recognizable in the bendy course of the outer moat that still surrounds the old town. The most recent defensive structure around the city is the Stelling van Amsterdam, a 135 km long ring of fortifications around Amsterdam, consisting of 42 forts and other works. Arnhem Gelderland One or more individual structures (Bastions, gates, towers, etc.) remain. Only the 14th-century Sabelspoort remains. Asperen Gelderland One or more individual structures (Bastions, gates, towers, etc.) remain. On the side of the Linge River, a stone wall, incorporating the bases of several towers, remains. The water gate, giving access to the old harbor, is partially reconstructed. On the land side, parts of earthen ramparts and moats remain. Bad Nieuweschans Groningen Vestiges of the fortifications are visible in the landscape. The walls of the tiny fortified village have been partially demolished, although a small section remains. Bergen op Zoom North Brabant Yes One or more individual structures (Bastions, gates, towers, etc.) remain. Of the medieval fortifications, only the 14th-century Gevangenpoort remains. Of the extensive 17th-century fortifications, only one single ravelin remains. Bolsward Friesland Yes One or more individual structures (Bastions, gates, towers, etc.) remain. A moat still encloses the town center. Bourtange Groningen Yes The fortifications were recently reconstructed. The original fortifications were demolished in the 19th century, but have been reconstructed from 1960 onwards, in a successful effort to revitalize the village. Breda North Brabant One or more individual structures (Bastions, gates, towers, etc.) remain. The only notable remnant of the city walls is the Spanjaardsgat gate; a water gate defended by two multiangular towers. It forms part of the defenses around Breda Castle, which in turn formed an integral part of the city walls. Bredevoort Gelderland Yes One or more individual structures (Bastions, gates, towers, etc.) remain. Part of the ramparts, located on the north-east of the town, have been reshaped into a park. To the south-west, a windmill stands on top of a remnant of one of the bastions. Brielle South Holland Yes The city wall remains intact. The old town is completely enclosed by earth ramparts, featuring nine bastions, as well as multiple outer works. Brouwershaven Zeeland Yes One or more individual structures (Bastions, gates, towers, etc.) remain. Part of the ramparts, located on the east and north of the town, remain intact. Buren Gelderland Yes Sizable parts of the fortifications remain intact. On the east side of town, facing the river, an impressive wall remains. On the north-west side of the town, a city gate remains, flanked by a row of houses built against the old town wall. Culemborg Gelderland One or more individual structures (Bastions, gates, towers, etc.) remain. The old town, its medieval extensions, and the site of the old castle, are still surrounded by a moat. Of the oldest, the 14th-century city wall, one city gate remains, while several fragments of the city wall stand on the south and east sides of the old town. Delft South Holland One or more individual structures (Bastions, gates, towers, etc.) remain. The old town is for the most part still surrounded by a moat. Along this moat stand two towers belonging to the medieval wall. On the eastern end of the old town stands the Oostpoort, a 15th-century combined land and water gate. Doesburg Gelderland Yes Sizable parts of the fortifications remain intact. The fortifications around the old city have been demolished, but the advanced line of defenses to the east of the city remains intact as part of a nature reserve. Dokkum Friesland Yes The city wall remains intact. The old city is completely enclosed by a line of earth ramparts, featuring five bastions. Dordrecht South Holland One or more individual structures (Bastions, gates, towers, etc.) remain. The old city is completely enclosed by a moat, while the old harbor is guarded by the Groothoofdspoort, a late medieval city gate, later rebuilt in a Renaissance style. Elburg Gelderland Yes Sizable parts of the fortifications remain intact. The old city is completely enclosed by a moat and a 16th-century rectangular earthen rampart with a bastion at each corner. The rampart was changed into a park in the 19th century, but the defenses are still easily recognizable. Several of the old gates were defended by a barbican, the lower parts of which have been excavated and the casemates of one of the barbicans can be visited. Several sections of the medieval city wall still stand behind the 16th-century rampart. One tower of the medieval wall had been changed into a gate in the 16th century. This structure forms the last remaining city gate of the old town. Enkhuizen North Holland Yes Sizable parts of the fortifications remain intact. The landward side of the old town is still completely surrounded by an earthen rampart with five bastions. The last remaining gate facing the landward side of the city is the 17th-century Koepoort. The most impressive remnant of the fortifications is the 16th-century 'Drommedaris' gate, which stands near the harbor. Franeker Friesland One or more individual structures (Bastions, gates, towers, etc.) remain. The old city is completely enclosed by a moat. The locations of the old bastions and bulwarks are still recognizable in the shape of the moat. Gennep Limburg Sizable parts of the fortifications remain intact. Lowered remnants of the old city walls surround the west and north sides of the old town. Geertruidenberg North Brabant Yes Sizable parts of the fortifications remain intact. Most of the fortifications were demolished, but restored sections of the bastioned trace remains to the north and east sides of the old town. Goes Zeeland One or more individual structures (Bastions, gates, towers, etc.) remain. Gorinchem South Holland Yes The city wall remains intact. The old city is completely enclosed by an intact city wall. To the west of the city, the bastioned trace was demolished in order to accommodate the construction of a canal. The defences on that side were subsequently replaced by a Caponier. Gouda South Holland One or more individual structures (Bastions, gates, towers, etc.) remain. The old city is completely enclosed by a moat. The remains of a town gate are located near a street named Bogen, meaning 'Arcs', named after the arcs built in the medieval town wall which its trace once ran alongside the Turfsingel side of the street. A part of the town wall is located at the corner Oosthaven with Nieuwe Veerstal. This part of the walls itself once was a part of Gouda castle. Other remains of the castle include subterraneans, cellars and fundaments of walls and touwers arel located in the Houtmanplantsoen, behind the nearby windmill. The lower part of this windmill is a remnant of one of the castle's towers. Grave North Brabant One or more individual structures (Bastions, gates, towers, etc.) remain. Fragments of the double system of moats remain, as well as one city gate. The lower portions of several round medieval towers can be seen at the old harbor. The water gate, leading down to the river Maas, is a recent reconstruction. Groenlo Gelderland Yes One or more individual structures (Bastions, gates, towers, etc.) remain. The old town is partially surrounded by an old moat, which clearly shows the locations of the old bastions. Part of the bastion trace has been reconstructed. Groningen Groningen One or more individual structures (Bastions, gates, towers, etc.) remain. The old town is surrounded by a moat. Haarlem North Holland One or more individual structures (Bastions, gates, towers, etc.) remain. Hardenberg Overijssel Vestiges. The only remnant of the medieval town walls is a small lowerd part of a wall at the western end of the Wilhelminaplein, next to an old water pump. Harderwijk Gelderland One or more individual structures (Bastions, gates, towers, etc.) remain. Several sections of the old medieval wall remains, the most sizable parts being located to the north of the old city, facing the former Zuiderzee. Two gates, the Vischpoort and the Smeepoort, still remain. The Vischpoort has a lighthouse installed on the roof. Harlingen Friesland One or more individual structures (Bastions, gates, towers, etc.) remain. Several sections of the moat, indicating the presence of three of the old bastions, remain on the east side of the city. Hasselt Overijssel One or more individual structures (Bastions, gates, towers, etc.) remain. On the landside of the city, remnants of the ramparts, featuring four sizable bastions, remain incorporated in a park. Hattem Gelderland One or more individual structures (Bastions, gates, towers, etc.) remain. On the landside of the old town center some remnants of the city walls remain. On the side of the old town facing the river IJssel, the Dijkpoort can be found. Hellevoetsluis South Holland Yes The city wall remains intact. The old navy harbor is still entirely surrounded by a bastion trace, which is outfitted with a brick revetment on the side of the walls facing the river. Heukelum Gelderland One or more individual structures (Bastions, gates, towers, etc.) remain. The town is still enclosed by a moat on the three sides facing away from the river Linge. Heusden North Brabant The fortifications were recently reconstructed. The city walls had been slighted in the 19th century, but have been extensively reconstructed during the middle of the 20th century. Hoorn North Holland One or more individual structures (Bastions, gates, towers, etc.) remain. The old town is still surrounded by a moat. One city gate remains, the 16th-century Oosterpoort. The most notable remnant of the city defenses, however, is the Hoofdtoren, an impressive 16th-century tower, built to defend the harbor. Hulst Zeeland Yes The city wall remains intact. The old town is still surrounded by a rampart and a moat. Several remnants of outer works, such as ravelins and an outer wall, remain. IJzendijke Zeeland One or more individual structures (Bastions, gates, towers, etc.) remain. IJsselstein Utrecht One or more individual structures (Bastions, gates, towers, etc.) remain. The old moat remains, while some remnants of the town wall remain on the south and east side of the old town. Kampen Overijssel One or more individual structures (Bastions, gates, towers, etc.) remain. The old moat remains, while the old earthen ramparts remain incorporated in a park. Three medieval city gates remain, two of which have been rebuilt in a renaissance style. The largest gate, the Kroonmarktpoort, retained its medieval appearance. Klundert North Brabant Yes One or more individual structures (Bastions, gates, towers, etc.) remain. Several sections of the ramparts and bastions remain intact to the north and south of the old town. Leerdam Utrecht Yes One or more individual structures (Bastions, gates, towers, etc.) remain. The city wall remains intact on the side of the town facing the river Linge. Leeuwarden Friesland One or more individual structures (Bastions, gates, towers, etc.) remain. The old town is still entirely surrounded by a moat. Several bastions to the north of the old town have been changed into a park. Leiden South Holland One or more individual structures (Bastions, gates, towers, etc.) remain. The old city is still surrounded by a moat. Of the city defenses, two city gates remain and one medieval tower stand to the south of the old town. Part of a bastion on the east side of the city has been reconstructed. Maastricht Limburg Yes Sizable parts of the fortifications remain intact. Important parts of all major fortification systems remain intact. Of the first city wall, the Helpoort gate remains, as well as several important sections of the oldest 13th-century city wall. Important parts of the second medieval city wall remain on the east side of the old town, while extensive remnants of the complicated system of baroque fortifications can be found to the north. Additionally, a large network of underground communication tunnels, casemates, and countermines remain underneath the present outskirts of the city, which were built on top of the old city walls. Megen North Brabant One or more individual structures (Bastions, gates, towers, etc.) remain. Only a single 14th-century tower, known as the Gevangenpoort, remains. Middelburg Zeeland Yes One or more individual structures (Bastions, gates, towers, etc.) remain. The bastioned trace of the city wall has been changed into a park and is still surrounded by a moat. Only one city gate remains, the 18th-century Koepoort. Montfoort Utrecht One or more individual structures (Bastions, gates, towers, etc.) remain. One of the medieval city gates has been incorporated into the town hall. Another remaining portion of the town wall remains to the south west of the old town. Muiden North Holland Yes Sizable parts of the fortifications remain intact. The 16th-century town walls were greatly adapted in the 19th century, when the town became part of the advanced defenses of Amsterdam. The city walls located to the west of the river Vecht remain intact, as do the walls around the Muiderslot castle. Naarden North Holland Yes The city wall remains intact. Naarden is one of the best preserved fortified cities in Europe, featuring a double system of moats and walls, built in the 17th century. The inner wall features numerous underground tunnels, casemates, and barracks. Nieuwpoort, South Holland South Holland Yes The city wall remains intact. The tiny town is entirely surrounded by an earth rampart featuring six bastions and a false bray in front of the curtain walls. The town hall is built over a canal running through the center of town and defends a system of locks with which the land surrounding the fortress could be inundated. Nijmegen Gelderland Sizable parts of the fortifications remain intact. Sizable parts of the medieval city walls remain to the west and east of the old city. The most notable remnant is the wall, and three towers, located in the Kronenburger park. Of the three towers, the Kronenburger tower is arguable one of the most impressive medieval towers in the Netherlands. Ootmarsum Overijssel Vestiges. The old town is still fully enclosed bij two ringroads, called the Westwal (Western wall0 and the Oostwal (Eastern wall), indicating the trace of the medieval walls. Oudeschans Groningen Yes Sizable parts of the fortifications remain intact. The walls of the tiny fortified village have been partially demolished, but remain very recognizable. Part of the city walls have subsequently been reconstructed in the 20th century. Oudewater Utrecht One or more individual structures (Bastions, gates, towers, etc.) remain. The old city is enclosed by a moat. The locations of some of the old bastions and bulwarks are still recognizable in the shape of the moat. Philippine Zeeland Vestiges of the fortifications are visible in the landscape. Remnants of bastions, ravelins, and other outworks are clearly distinguishable in the fields surrounding the town. Ravenstein North Brabant One or more individual structures (Bastions, gates, towers, etc.) remain. A moat surrounds much of the old town, clearly showing the location of bastions and ravelins. The remnants of two hornworks are visible to the north and south of the old town. The side of the town facing the river Maas features the remnants of two bastions, excavated from the body of the dyke, as well as the single remaining city gate. Retranchement Zeeland Yes The city wall remains intact. Retranchement was built in 1604 AD as an entrenched camp, consisting of two small, square forts, connected by a wall with three bastions. The northern fort no longer exists as it was destroyed in a flood in 1682 AD. Rhenen Utrecht One or more individual structures (Bastions, gates, towers, etc.) remain. Lowered fragments of the 14th-century city wall can be found to the south of the old town. To the north, a windmill stands on top of a remnant of the wall. On the eastern entrance of the old town, the remnants of a sizable barracane can be found. Roermond Limburg One or more individual structures (Bastions, gates, towers, etc.) remain. Several fragments of the medieval city wall remain. The most notable and best preserved remnant is the Rattentoren, a 14th-century round tower standing on the north side of the old town. Sas van Gent Zeeland One or more individual structures (Bastions, gates, towers, etc.) remain. Of the once powerful and strategic fortress, very little remains. Most of the fortifications were demolished in 1930. What remains are the remnants of one bastion, upon which the base of an old windmill stands, and the remnants of an old late 17th-century tidal mill, which was built into the fortifications. Schiedam South Holland One or more individual structures (Bastions, gates, towers, etc.) remain. Parts of the moat remain, including the northern and western part. The famous Schiedam windmills are built on top of the bases of wall towers. Schoonhoven South Holland Yes One or more individual structures (Bastions, gates, towers, etc.) remain. Only a fragment of the old moat remains on the landward side of the town. On the riverside stands the Waterpoort, the last remaining city gate, with some adjacent stretches of the old town walls. Sittard Limburg Yes Sizable parts of the fortifications remain intact. The powerful fortress town was destroyed by French forces in 1677 AD. Sizable remnants of the medieval city wall remain, buried underneath a later earthen rampart which still surrounds most of the old town. Sluis Zeeland Yes The city wall remains intact. The old town of Sluis was completely destroyed in the second world war, but he extensive fortification system remained intact and can still be visited today. Sloten Zeeland Yes Sizable parts of the fortifications remain intact. The tiny fortress town of Sloten is still mostly surrounded by its ramparts, while the moat still completely encircles the town. Two water gates remain intact at the places where an old canal dissects the town. Steenbergen North Brabant Vestiges of the fortifications are visible in the landscape. Some fragments of the old moat remain. The locations of the old bastions can be recognized by the course of the moat and the street pattern. Remnants of the outer works are distinguishable in the surrounding landscape. Steenwijk Overijssel Yes Sizable parts of the fortifications remain intact. Sizable parts of the moats and ramparts remain. Stevensweert Limburg Vestiges of the fortifications are visible in the landscape. Although the walls themselves have been demolished, the town was built as an ideal fortress, and features the characteristic spider web street pattern that many such towns were built with. Part of the city walls have been reconstructed from 2007 AD onwards. Tholen Zeeland Yes One or more individual structures (Bastions, gates, towers, etc.) remain. The ramparts were changed into a park, but the moat is still present and four bastions are still recognizable. Tiel Gelderland One or more individual structures (Bastions, gates, towers, etc.) remain. Fragments of the moat remain, as well as one city gate. Utrecht Utrecht Yes One or more individual structures (Bastions, gates, towers, etc.) remain. The medieval city wall has been completely demolished. Remnants of three of the 16th-century Italian style bastions remain. The most complete bastion is Sonnenborgh. Most of the old city fortifications were changed into an English style landscape park in the 19th century. The Dutch Water Line forms a double ring of fortresses where it passes east of the city. Valkenburg aan de Geul Limburg One or more individual structures (Bastions, gates, towers, etc.) remain. Two city gates remain at the foot of the ruined castle. Part of the city wall remains to the west side of the old town. The small Den Halder castle was built around an old tower of the city wall. Veere Zeeland Yes Sizable parts of the fortifications remain intact. Venlo Limburg One or more individual structures (Bastions, gates, towers, etc.) remain. Nearly nothing remains of the once extensive fortifications of Venlo. The most extensive remnant being a stretch of 14th-century wall known as the "Luif"
Vianen Utrecht One or more individual structures (Bastions, gates, towers, etc.) remain. The Lekpoort is the last remaining city gate of the little town of Vianen. Apart from the gate, a large part of the town is still enclosed by a moat, while a sizable length of (lowered) city wall still stands on the south side of the town. Vlissingen Zeeland Yes One or more individual structures (Bastions, gates, towers, etc.) remain. Several remnants of bastions, curtain walls and a tower of a medieval city gate, still stand on the waterside. The landward facing defenses have all been demolished. Wageningen Gelderland One or more individual structures (Bastions, gates, towers, etc.) remain. The foundations of a small stretch of the medieval city wall have been unearthed and restored. Of the later ramparts, the moat remains, its trace clearly showing the locations of the old bastions. Weesp North Holland Yes The city wall remains intact. Only four of the planned eight bastions were constructed. All four remain intact and surrounded by a moat. In the 19th century, a circular fort was constructed on an island in the river Vecht. Willemstad North Brabant Yes The city wall remains intact. In 1583 AD, prince William of Orange orders the construction of a fortified city on the location of the village of Ruigenhil. The city, called Willemstad, is still entirely surrounded by its seven sided city wall. Wijk bij Duurstede Utrecht One or more individual structures (Bastions, gates, towers, etc.) remain. A portion of the moat remains, as do several fragments of the city wall facing the riverside. One city gate still stands as a windmill has been built on top of it. The ramparts that surround the ruins of Duurstede castle have been reshaped into a landscape style park. Woerden Utrecht Yes One or more individual structures (Bastions, gates, towers, etc.) remain. Sizable sections of the inner and outer moats still remain and several of the bastions are still recognizable as such. The medieval castle still stands on the south eastern side of the old town. Woudrichem North Brabant Yes The city wall remains intact. Zaltbommel Gelderland Yes Sizable parts of the fortifications remain intact. The earthen ramparts and its bastions were made into an English landscape park in the 19th century, but the structures remain intact up to a significant height and are easily recognizable. The outer moat still encloses the landward side of the city. Behind the earthen ramparts stand several sizable fragments of the medieval city wall. Zierikzee Zeeland Yes One or more individual structures (Bastions, gates, towers, etc.) remain. Zutphen Gelderland One or more individual structures (Bastions, gates, towers, etc.) remain. Remnants of moats from the medieval and post-medieval fortifications are still visible around the old town. The remnants of the medieval fortifications include several towers, the impressive Drogenapstoren gate, the Bourgonjetoren bastion, a water gate named Berkel gate, and a sizable stretch of the old city wall to the south of the old town. Zwolle Overijssel One or more individual structures (Bastions, gates, towers, etc.) remain. 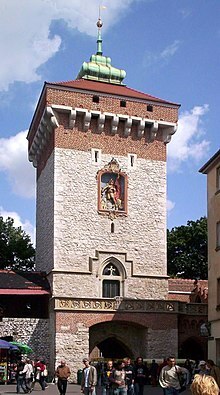 Bolesławiec – the old town has fragmentary remains of the old town wall, including several towers and stretches of wall. Brzeg – a star-shaped park around the old town is what remains of the renaissance fortifications. Some parts of the moat still remain. The shape of seven bastions is recognizable from the air. Chełmno – almost whole length of walls (2.2 km), with 17 watch towers and city gate, 13th and 14th centuries. Kłodzko – the remains include the impressive citadel located on a hill north of the medieval town. Kołobrzeg – a round basion and a part of the moat still remain. Kostrzyn – the medieval town was entirely destroyed during World War II, only remaining some ruins of houses, the ruins of a church and the riverside fortified walls. 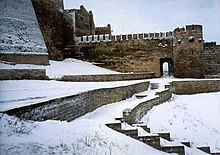 The fortified walls include three bastions and a land gate. The remaining moat of an outer work is located north west of the ruined medieval town. Maszewo – the town walls are nearly complete, apart from two breaches made for the increasing traffic. The two original town gates are demolished, and an adjacent tower of one of the gates still remains. Nowe – sizable parts of the walls remain. Nowe Miasto Lubawskie – two town gates remain. Nysa – there are large remains of the renaissance fortifications, notably to the east of the old town and to the north of the Nysa Klodzka river. There are several forts around Nysa. The remains of the medieval town walls include two land gates, the remains of a water gate, some towers and stretches of wall. Opole – the remaining walls are located in the north east corner of the medieval town. Szczecin – to the east of the castle remains a well-preserved wall tower. Two town gates still remain. Wolin – only one bastion remains to the south of the town. Almeida Vauban style fortress town. Bragança – the old town is still completely surrounded with medieval walls, including all 12 towers and two gates. Elvas - Elvas is among the finest examples of intensive usage of the trace italienne (star fort) in military architecture. Lisboa, Portugal - There are fragments of a Fernandin Wall since the 13th century. Setúbal - the remains of 5 bastions can be found around town. The Sassanian fortress in Derbent. Smolensk City Wall in 1912. Bratislava – only few structures have survived from original fortifications. Kremnica – about two-thirds of the defensive walls around the town preserved, with several bastions and the city gate with barbican. Buitrago del Lozoya - has complete medieval walls. Monforte de Lemos - most of the 13th century city walls have been preserved, including two gates. Tui - a large part of both the 12th century wall and the 17/18th century fortifications has been preserved. Zamora – the old town walls remain largely intact, especially at the north, west and riverside of the old town. Gothenburg has a part of the western city wall left, the bastion Carolus Rex at Esperanto platsen (Esperanto square) and most of the city moat is still left. 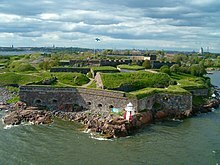 Halmstad had renaissance ramparts. To the north of the old town a bastion with adjacent town gate remains, the Norre Port. To the south of the old town a bastion with a remnant of the moat remains. Kalmar substantial remains of the walls. Sizable stretches of walls and a bastion remain to the south of the old town. To the east remain two bastions. To the north remain portions of wall near Fiskaregatan. To the west the shape of two bastions is clearly recognizable, with a ravelin in front of the remaining town gate Westport (Westgate). Two other town gates still remain, an unmanned gate of later date at the Skeppsbrogatan, and a gate at Skeppsbron. Stockholm has a small remainder of the medieval city wall preserved. Plan of Geneva and environs in 1841. The colossal fortifications, among the most important in Europe, were demolished ten years later. Aarau – the remains of the medieval town walls include two town gates (the Haldertor and the Oberer Turm) and a tower (the Pulverturm) with an adjacent stretch of wall. Arbon – the remains include some fragments of wall and a tower converted into a house. Liestal – one town gate remains. Lucerne – the wall on the northern bank of the Reuss is well preserved and among the principal landmarks of the city. It is called Museggmauer and Stadtmauer. The late medieval walls of Lucerne, called Museggmauer or Stadtmauer. Solothurn – large parts still remain, including several walls, towers and a bastion. Two town gates remain, the impressive Baseltor and the Bieltor. Zug – the only remainder of the inner town walls is the Zeitturm (Clocktower), a medieval town gate. The remains of the outer town walls include four towers (the Kapuzinerturm, Knopfliturm, Huwilerturm and the Pulverturm), and some stretches of wall. Zurich – the main remains are the Schanzengraben, and the shapes of several bastions are recognizable through the course of the moat. One bastions remains largely intact, and it now houses the Alter Botanischer Garten. Troy. The ancient city of Troy was famous for its defensive walls. 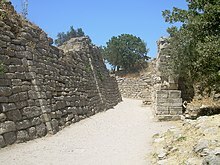 There is archaeological evidence that Troy VII, generally identified as the stage of the legendary Trojan War of Homer's Iliad, usually dated between 1194 BC – 1184 BC, had walls with a carefully built stone base over four meters thick and some nine meters high in places, which was surmounted by a larger superstructure with towers in mudbrick. The walls in Homer's epic are so mighty that the siege of Troy by Achaeans lasts more than nine years, and only could be finished with the trickery of the Trojan Horse. Sections of the stone base of Trojan walls still survive on the archaeological site in present-day Hisarlık, in Çanakkale Province. Istanbul. The system of walls around (as it was then known) Constantinople built in 412 by the Roman emperor Theodosius II was a complex stone barrier that stretched 6.5 kilometers and is often called the Wall of Theodosius. This barrier stood impregnable for ten centuries and resisted several violent sieges until 1453 when the Ottomans succeeded in breaching the walls. There was a new element in the battlefield: the Ottoman army had powder cannon and the walls offered limited resistance to them. Diyarbakır. Diyarbakır is surrounded by an almost intact, dramatic set of high walls of black basalt forming a 5.5 km (3.4 mi) circle around the old city. There are four gates into the old city and 82 watch-towers on the walls, which were built in antiquity, restored and extended by the Roman emperor Constantius in 349. Alnwick Grade 1 listed Bondgate (Hotspur Gateway) and section of wall remain of medieval defences, Pottergate Tower is C18 rebuild of medieval gate and may incorporate some medieval fabric. Bath – Several fragments of the medieval wall still survive. The East Gate is the only remaining gateway. The length of wall opposite the Mineral Water Hospital is largely a reconstruction of the medieval wall. By far the best length, over 160 ft, could until 1963 be seen on the site cleared by an air-raid in 1940. This was the SE corner of the medieval city. The remains of this wall now lie buried below the floor of the new Woolworths store. Berwick-upon-Tweed – the Elizabethan ramparts with their bastions, gateways and earthworks survive. Spades Mire is an earthwork linear ditches, possibly forming an outer line of defence for medieval Berwick. Situated on the south side of the ditch are traces of an accompanying rampart, now much spread and up to 13m wide. The Lord's Mount is a massive curved stone bulwark which was built in the 1540s to protect the town walls at their weakest point. Bridgnorth – the North Gate is still present, the site of the former Postern Gate still very visible; and parts of the wall now form garden walls in various parts of the town. Canterbury – originally fortified by the Romans, over half of the original circuit survives, including Westgate, the largest surviving city gate in England. Carlisle – The castle and western walls largely survive. Chester – the city walls are one of the city's biggest tourist attractions. They were originally built by the Romans and continue to form a complete ring around much of the present-day city centre. Colchester – the town was surrounded by a wall built by the Romans after Boudica had sacked the town. Approximately half of the walls remain. Coventry – the walls were demolished in 1662. Two gates survive, connected by a section of wall that runs through Lady Herbert's Garden. Other small fragments dotted around the city centre, mainly hidden by modern buildings, include the remains of a bastion near Upper Well Street. Several fragments have been incorporated into newer buildings, including the Town Wall Tavern. Durham – The Castle formed the largest part of Durham's defences, with the neighbouring "Backgate", demolished in the 1760s, which sat across Sadler Street. This was accompanied by a Gaol, which survived until the 1840s, remains of which are present in an alley off Sadler Street. Other walls surrounding the centre of Durham survive between the River Wear, and the houses lining a number of thoroughfares: Sadler Street, North Bailey, South Bailey, and Palace Green. The street names North Bailey and South Bailey are testament to this fact. It is debatable just how defensive these walls were, and some parts have since become garden walls. The archway of a Water Gate survives where South Bailey meets Prebends' Bridge. Great Yarmouth – about two-thirds of the wall remains. Of the original eighteen towers, eleven survive. London – fragments of London Wall, the wall that once surrounded the Roman town of Londinium, are still visible just outside the Museum of London and at Tower Hill in the City of London. Newcastle upon Tyne – much of the town wall was demolished during the late 18th and early 19th centuries but several sections still remain. Oxford – major fragments are preserved in the gardens of New College and Merton College and as part of the exterior wall of Pembroke College on Brewer Street. Salisbury – around the original medieval city, including the cathedral and the close. Silchester – the nearby deserted Roman town of Calleva Atrebatum has a complete set of walls. Southampton – Lengthy sections of Southampton town walls remain, especially to the south and west. Winchester "Walls fragmentary, but traceable throughout their length. Repaired in C14 and C15. Limestone rubble. South east corner of full height complete with battlements. Walls shared by the city, Wolvesey Palace, Cathedral Close and Wolvesey Castle. Two gates remain. Wall ran along line of Roman Wall." York – the extensive city walls are the longest and most complete in England, lacking only a few short sections and most of the posterns. Derry walls withstood a siege during the Siege of Derry and are amongst the best preserved in Europe. Dundee has only one remaining section of its city walls, first constructed in 1545, the Wishart Arch. Edinburgh, walled from the 12th century, fragments of the 16th-century Flodden Wall and 17th-century Telfer Wall remain. ^ "12 Impressive Walled Cities in the World". Retrieved 9 December 2012. ^ Castillero, Alfredo (2004). UNESCO Guides: Panamá la Vieja and Casco Viejo. UNESCO Publishing. ISBN 92-3-103923-7. ^ "St. Augustine Town Plan Historic District-American Latino Heritage: A Discover Our Shared Heritage Travel Itinerary". Nps.gov. Retrieved 2018-09-16. ^ "New Orleans before the battle The Battle of New Orleans December 1814 - January 8, 1815". battleofneworleans.org. Retrieved 2016-09-04. ^ Administration, Works Progress (2011-08-15). New Orleans City Guide. Garrett County Press. ISBN 9781891053405. ^ Institute of Taiwanese History, Academica Sinica. "清代臺灣城郭". 台灣歷史文化地圖. ^ "St. Laurence's Gate - Drogheda Walls | Attractions | Museums and Attractions | All Ireland | Republic of Ireland | Louth | Drogheda | Discover Ireland". Discoverireland.ie. Retrieved 2018-09-16. ^ Muralla de Tui - Asociación Española de Amigos de los Castillos. ^ Muralla urbana de Viveiro. ^ "Alnwick Town Wall". Gatehouse. Retrieved 18 September 2011. ^ "Bath City Wall". Gatehouse. Retrieved 18 September 2011. ^ Berwick Town Wall. "Gate". Gatehouse. Retrieved 18 September 2011. ^ "The Town Wall Tavern". realalerambles.co.uk. Retrieved 23 April 2018. ^ "Winchester City Wall". Gatehouse: A comprehensive gazetteer and bibliography of the medieval castles, fortifications and palaces of England, Wales and the Islands. Retrieved 18 September 2011.